Well, I hope you've read my article on How To Spot That Fake Bag & Guide To An Authentic Louis Vuitton Bag. By now, you should have an idea of telling the difference between the genuine & counterfeit. From here, I'm going into details on the authenticity of Christian Dior Bags. Both the cards above (from different bags) are authentic but notice the difference? 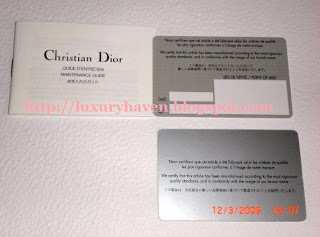 Also, most Dior sales staff do not complete the back of the Authenticity Certificate Cards. ALL Dior bags come with a white cotton dustbag with grey writing that reads: Christian Dior on the first line & Paris on the bottom. A silk dustbag indicates a counterfeit. Dior's famed Saddle Bag is handcrafted from logo fabric with fine leather trim & signature hardware. Curved & graceful to tuck neatly beneath the shoulder, a distinctive classic bag to carry season after season. The Saddle Bag has a very distinct shape, while most fake do not have the correct shape. 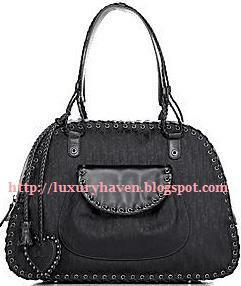 Typically, Dior’s tag will be of the same colour & leather as the bag. So a combination leather & fabric bag should have a tag that matches the leather portion of the bag, eg. 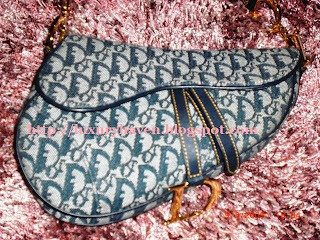 The Dior Saddle Bag. 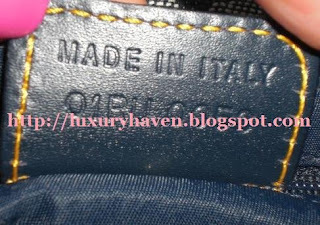 The front tag will be embossed with "Christian Dior" & "PARIS", while the back has "Made in Italy" or "Made in Spain" & a serial code. Hihu...does Dior bag comes in different version for Korea? Not too sure but sometimes different countries will have different models & special editions. Best to check in-stores. Happy shopping!